Now that it’s officially “the holiday season,” my inclinations are toward those foods that help us celebrate. There’s one I make year-round out of necessity (and craving!) 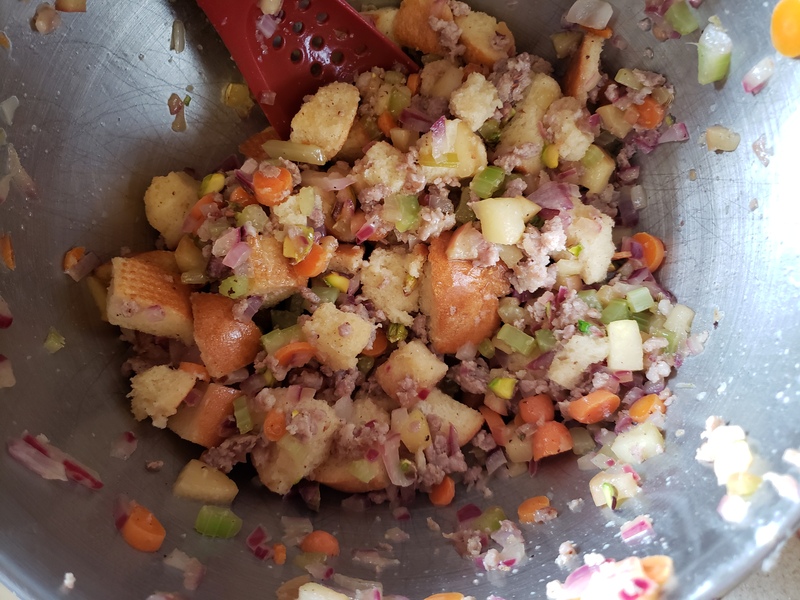 It’s another leftover rescue like quiche, frittatas, or soup. And it just so happens one of those occasions popped up this week. 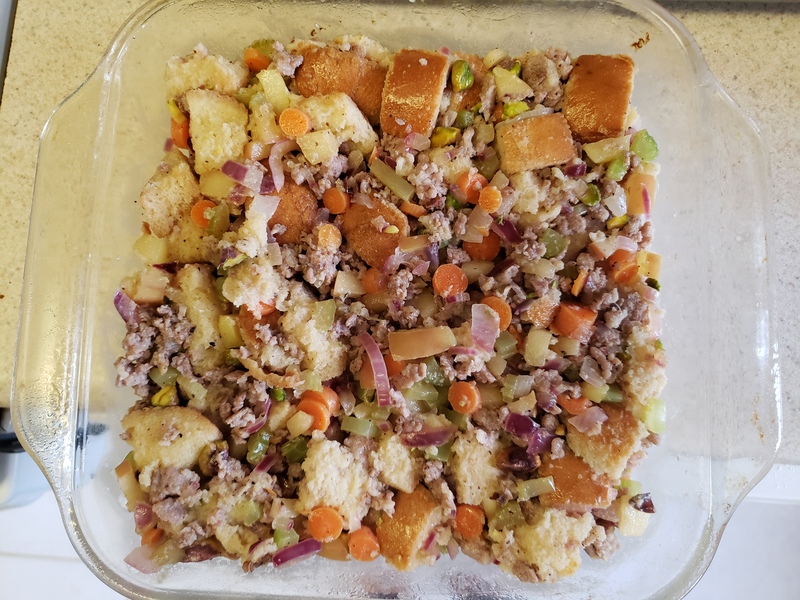 I had a half a loaf of rock-hard stale French bread, some vegetable/fruit odds and ends from the week’s cooking, and a couple lonely pieces of sausage left in a package from the farmers market that weren’t quite enough to make a meal. What does that sound like? Sounds like dressing (or stuffing, depending on your opinion) to me! Since we’re cooking in a baking dish and not a bird, we’ll go with dressing. 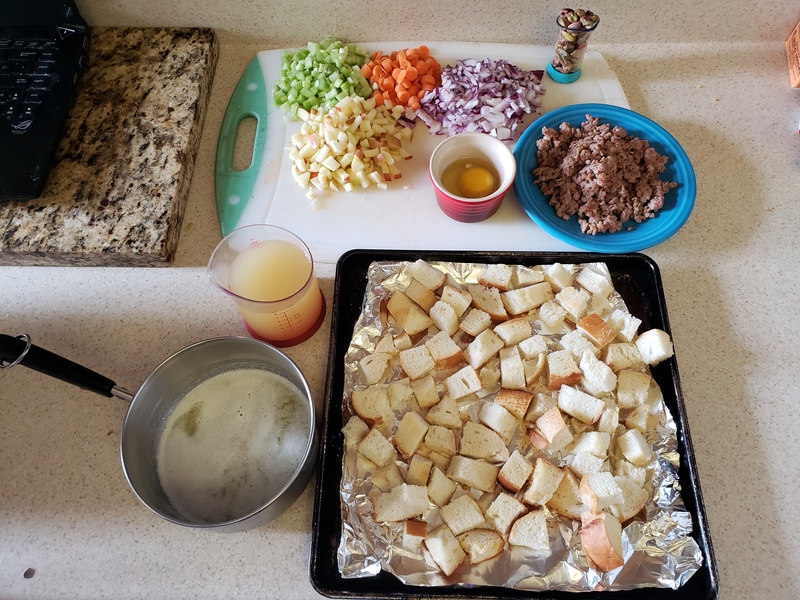 When I’m cooking dressing, my main concern is texture. 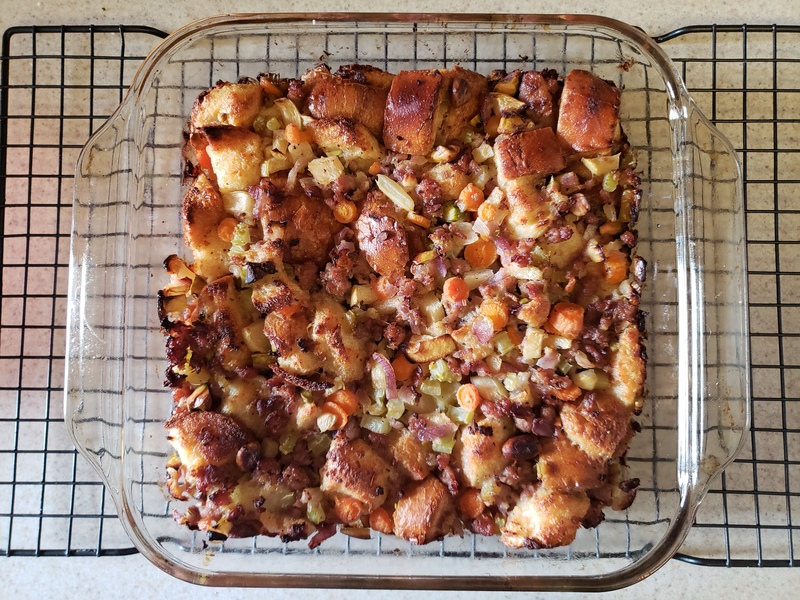 This is basically savory bread pudding, so we don’t want things to get too soft and one-note. Secondly, we want to balance flavors. Sausage is salty and fatty, so we need something crisp and sweet to play off of it. 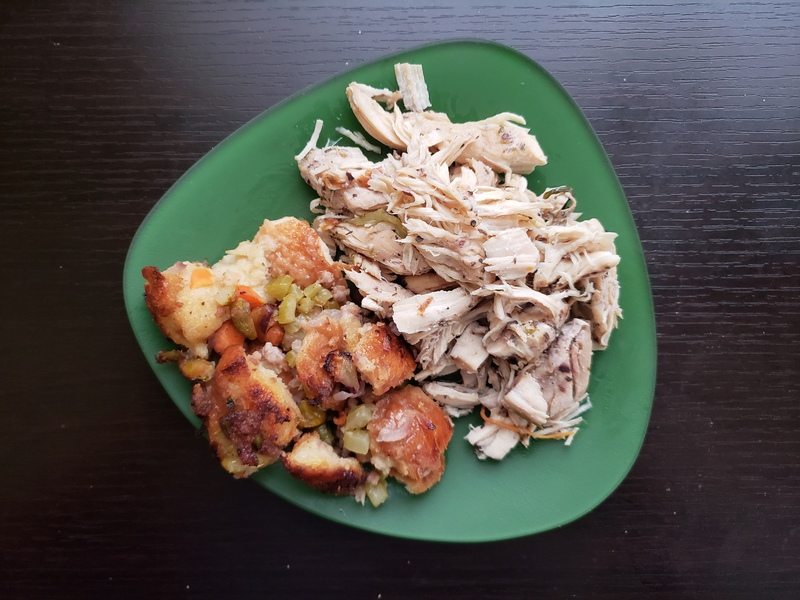 And that’s really the beauty of this dish, if there is something you don’t have, I’ll suggest a few alternatives in the recipe so you can build your own with your leftovers. Let’s clean out the fridge! Preheat the oven to 350 degrees F and grease an 8×8 in. pan. Toss the bread, crumbled sausage, and pistachios together in a large bowl and set aside. 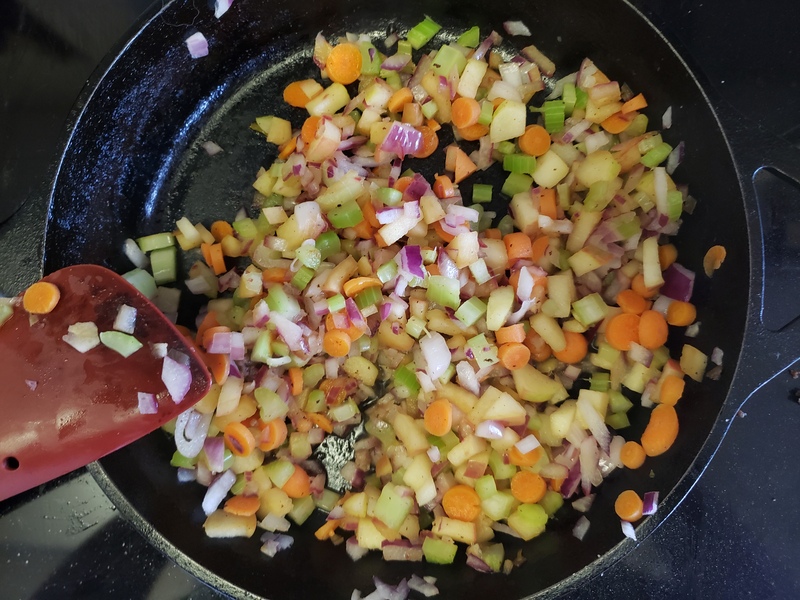 In a saute pan over medium heat, cook the onions, celery, carrots, and apple until softened, about 4-5 minutes. 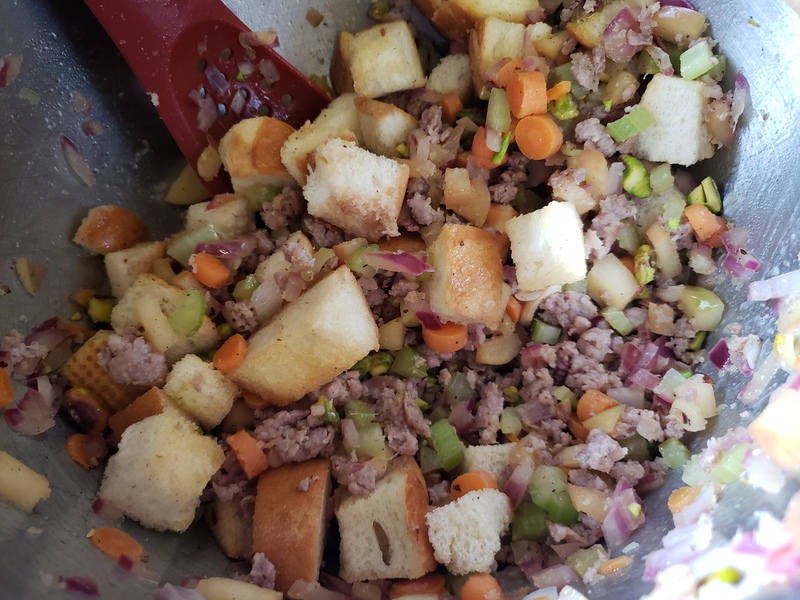 Add the vegetable mixture to the bread mixture and mix well. Stir in the melted butter. Whisk the egg and chicken stock together and then pour over bread mixture. Stir until the bread has absorbed all of the liquid. Season with salt and pepper. 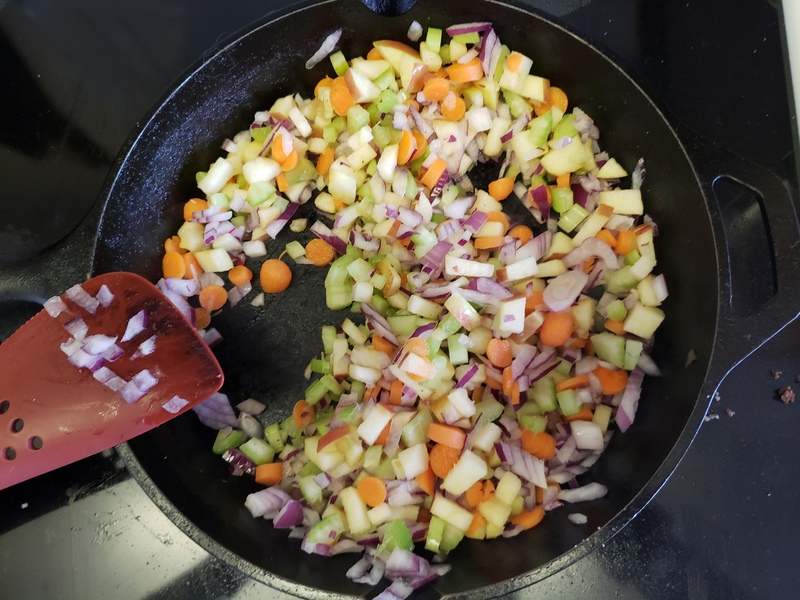 Pour the dressing into the prepared pan and smooth into an even layer. Dot the top with butter, cover with foil, and bake for 30-35 minutes. Remove the foil, increase the oven temperature to 450 degrees F, and bake for another 20-25 minutes or until well-browned. 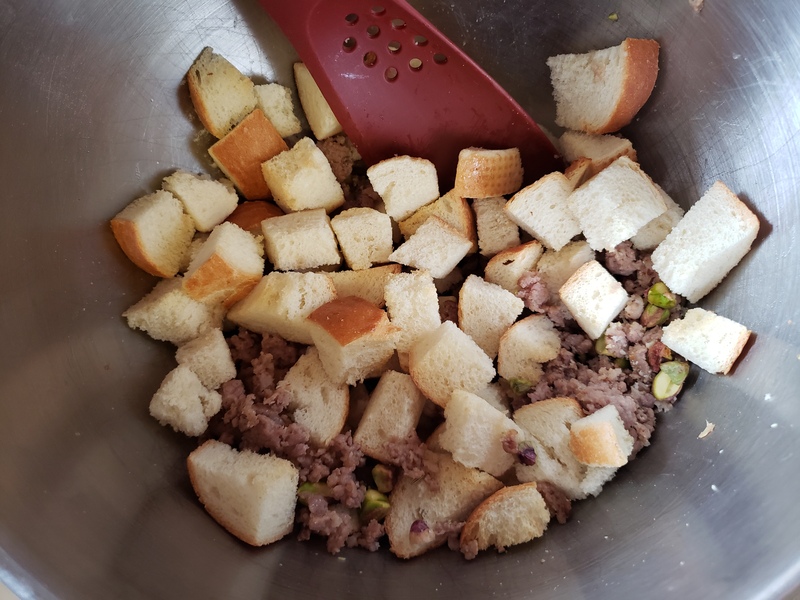 The bread is crisp on the outside, soft and custardy inside, the salty sausage and sweet apple play off each other well, and the pistachios add a great, nutty crunch to all of it. I had mine with some pulled chicken I made in the pressure cooker. You can easily double this recipe and bake in a 9×13 in. pan for a larger crowd, but this was just me using what I had on hand. Herbs are always welcome too. I like thyme and a little bit of sage, which I didn’t have this time, but definitely would if I was making this as part of a turkey dinner. This is tremendously useful on Thanksgiving when I have almost all of these ingredients at the ready from making other recipes. Whether for a special occasion or an end-of-week refrigerator clean-out, it’s a great recipe full of varying textures and flavors. And like all the best casseroles and bread puddings, it reheats beautifully. A super serviceable side dish indeed!